Bryan Cranston, with "All the Way" co-star Betsy Aidem, posed for photos with tourists outside the Delacorte Theater before attending last night's opening of "Much Ado About Nothing," the first offering of The Public Theater's free Shakespeare in the Park season. 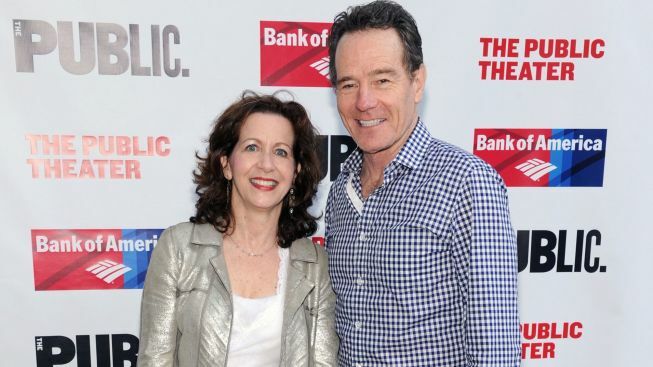 Bard buffs Bryan Cranston, John Lithgow and Jonathan Groff were among the celebs on hand for Monday night’s gala opening of “Much Ado About Nothing” at Central Park’s Delacorte Theater, the first offering of The Public’s free Shakespeare in the Park season. Lithgow, barely recognizable in a shaggy beard, will play “King Lear” in the second outing of the annual summer series. Other sightings in the star-packed audience last night included Matthew Morrison, Dana Delany, America Ferrera, Rachel Dratch, Hailey Feiffer, Celia Keenan-Bolger, Sarah Paulson, Judy Kuhn, Amber Tamblyn, Andrew Rannells, Julie White and Aaron Tveit. Shakespeare’s sometimes-serious romantic comedy, directed here by Jack O’Brien—the three-time Tony winner’s first outing at the Delacorte—features real-life paramours Hamish Linklater and Lily Rabe (pictured, bottom, at right, with Kathryn Meisle and Ismenia Mendes) as wise-cracking lovers Benedick and Beatrice. Central Park becomes sun-drenched Sicily in a production critics called “pleasure-filled” and “masterfully silly.” Here’s a closer look at what the reviewers had to say. “Much Ado About Nothing,” through July 6. Tickets are free, and distributed two per person at the Delacorte Theater in Central Park, beginning at 12 p.m. on the day of each performance. More information is available at publictheater.org.